Fouad Mourtada only wanted to make a joke when he set up a faked Facebook account for Prince Moulay Rachid of Morocco. It has proven to be a fatal error. On February 22, Mourtada was sentenced to three years in prison for his “crime” – setting up a Facebook account. Not because it was hilarious. summarizing the feelings of many netizens on the case. Many of them, Facebook users like Fouad Mourtada, felt the absurdity of a jail sentence for nothing but setting up a profile on Facebook, which was subsequently deleted a few days later. Prior to the trial, many Moroccan bloggers had started supporting the fellow netizen Mourtada. 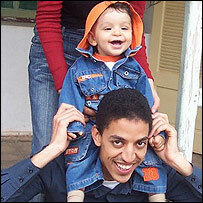 They set up the campaign site “Help Free Fouad” ((Help Free Fouad – Soutenez la libération de Fouad)). Together, they declared to be on strike for 24 hours on February 19, displaying a common message ((Global Voices Advocacy » Facebook’s fake prince could face five years in prison)). They also started a petition, urging the release of Fouad Mourtada ((Help Free Fouad » Sign Petition)), which has to time been signed by more than 5000 people. Currently, the supporters of Fouad Mourtada are preparing international demonstrations in several European and American cities, hoping to copy the enormous success of the late Free Kareem rallies. Naturally, there was also a huge storm of protest at Facebook, with a couple of groups supporting Mourtada being created. But the most interesting there is a question posed by Curt Hopkins of the Committee to Protect Bloggers, who asked Facebook for a statement on the case ((Committee to Protect Bloggers » Facebook’s response to Mourtada and others callous and inadequate)). All what Hopkins got was the response that Facebook would not comment on the issue. Possibly, because the Social Networks has been influential by finding out who created the fake profile. The way Mourtada’s identity had been leaked was not announced up to now. Citing Wall Street Journal’s Vauhini Vara, the Committe to Protect Bloggers reports ((Committee to Protect Bloggers » Facebook denies culpability in Mourtada debacle)) that Facebook denies to have forwarded Mourtada’s identity to the police. Nevertheless, the speaker announced that Facebook would do so in future cases, if lawfully forced to. You can sign the petition by “Help Free Fouad”. Also, you may become a member of one or more of the several Facebook groups in support of Fouad Mourtada – here or here. More physically, there will be several demonstrations held in support of the Moroccan “Facebook victim”. On March 1, 14:00, protesters will gather in front of the Moroccan embassies in Paris, Montreal, London, Brussels, Washington D.C., Amsterdam and Madrid. Additionally, you may follow Curt Hopkins’ call to support him in his efforts to get a statement from Facebook. He urges everybody to join him demanding a “less callous message from Facebook regarding the arrest”.